Puttari Polud (also called Huttari), the rice harvest festival of Kodagu, is perhaps the grandest and most elaborate festival in the Kodava calendar. The word putt-ari means new rice and the festival is celebrated on the full moon day during the Kodava month of birchyaar. One day before the Puttari feast, the Kaladcha festival is observed in the Padi Igguthappa Temple. Igguthappa is the god of the rice crop, harvest and rains. Preparations for Kaladcha and Puttari are commenced around 15 days in advance. The Pardanda family of Padi village, who are the deva thakka (temple caretakers), the parupatyagara (temple officials) families and other prominent families of Padi, Nelji and Perur villages are summoned in writing. On a particular day, they bring rice, coconut, jaggery, banana and areca nut to the shrine. Astrologers from Ammangeri village determine the date of Puttari feast. They arrive at the temple and convey the exact time for Puttari ceremonies, as determined by the stars. In the afternoon, astrologers, priests, caretaker families, musicians and other devotees go up Malma hill (Igguthappa Betta which is a few kilometres away from the temple), and announce the auspicious time at a shrine in the midst of a sacred grove. Then they will go to the Pardanda Ainmane in Padi and announce it again. At Malma, the temple caretaker announces the deva kattu (religious restrictions) to be observed by the people of the neighbourhood for the next 14 days. Accordingly eating meat, consuming alcohol, physically or verbally hurting animals or humans, pulling out plants and cutting trees are forbidden in the period. Marriages and funeral ceremonies are not to be conducted during the period. No special puja, except Satyanarayana Puja, is performed in the temple during the period. Afterwards the astrologers, caretakers and others go to the Makki Sarthavu Temple in Bethu village near Napoklu and announce the date and time again. The astrologers continue conveying the auspicious time to various families of the region. At each house, they are given thambutt powder, rice, jaggery, banana, salt and pepper, sufficient for a meal. Thambutt powder, prepared from boiled rice which is fried until it is golden brown, is used with mashed bananas and finally seasoned with sesame seeds and grated coconut to prepare the thambutt sweet dish. Kodava people gather in their ancestral house, called the ainmane, to celebrate the festival. On Kaladcha day, the deva thakka goes to Malma again and announces that the deva kattu need not be followed thereafter. This is called kattu muripo, or removing the restrictions. During Kaladcha, the temple deities are embellished with ornaments, and chendas (a percussion instrument) are played. Yetherata is also performed on the occasion. Decorated oxen are made to dance with bags (often rice bags) on their backs. Puttari Polud is first observed in the Padi Igguthappa Temple and the village of Padi. Hence, the first day is called the Padi polud (Padi celebration) or deva polud (divine celebration). The following day, the festival is celebrated in the rest of Kodagu and it is known as naad polud (public celebration). While the rituals at the temple are presided over by the archak (priest), the deva thakka performs the rituals. On both days, the first evening near the temple and the second at ancestral houses, the nere kattuvo (tying of certain leaves) and the kad edpo (cutting of paddy sheaves) rituals are performed. At the temple, these two ceremonies are followed by prasada (devotional meal). After dusk, a designated male family member ties together certain leaves around bits of the inoli creeper with pieces of achchi fibre into bundles. Each of these bundles, called a nere, is placed in a basket. Then an unmarried young lady from the family carries a small lit lamp upon a plate. She leads the family members to go down to the fields. A designated man ties a nere from the basket to the base of a sheaf of paddy and pours milk from a kutti (bamboo container) onto it. He cuts that sheaf (kad) with a sickle while the other family members cry out ‘Poly, Poly Deva!’ (Let us prosper, let us prosper, O God!). A gun is then fired into the air. Five, seven, nine or 11 sheaves of paddy are cut and given to the assembled family members. They carry these sheaves to the prayer place in the house. The nere bundles are then tied in various places around the house and the farm. Later, the thambutt sweet dish is consumed by the family. Firecrackers are burst in the night. On the day after naad puttari, the mane paado (house-singing) ceremony happens. Four folk singers of the village carry small hourglass drums, each called a dudi, and go from residence to residence. While all four strike the drums with cane sticks in rhythm, two of them take turns to sing verses praising the members of the family. A few days later, the villagers gather at the village greens (mand). The village musicians blow their horns and beat their large drums. The men dance in circles beating small rattan cane sticks called kola as they skip around in rhythm with the music. This is called the kolata or the stick-dance. 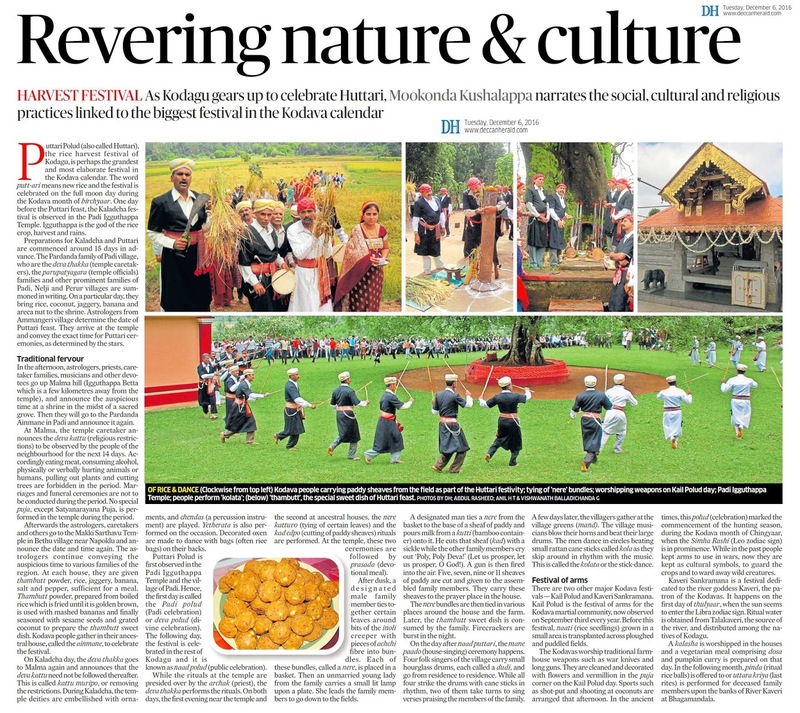 There are two other major Kodava festivals — Kail Polud and Kaveri Sankramana. Kail Polud is the festival of arms for the Kodava martial community, now observed on September third every year. Before this festival, naati (rice seedlings) grown in a small area is transplanted across ploughed and puddled fields. The Kodavas worship traditional farmhouse weapons such as war knives and long guns. They are cleaned and decorated with flowers and vermillion in the puja corner on the Kail Polud day. Sports such as shot-put and shooting at coconuts are arranged that afternoon. In the ancient times, this polud (celebration) marked the commencement of the hunting season, during the Kodava month of Chingyaar, when the Simha Rashi (Leo zodiac sign) is in prominence. While in the past people kept arms to use in wars, now they are kept as cultural symbols, to guard the crops and to ward away wild creatures. Kaveri Sankramana is a festival dedicated to the river goddess Kaveri, the patron of the Kodavas. It happens on the first day of thulyaar, when the sun seems to enter the Libra zodiac sign. Ritual water is obtained from Talakaveri, the source of the river, and distributed among the natives of Kodagu. A kalasha is worshipped in the houses and a vegetarian meal comprising dosa and pumpkin curry is prepared on that day. In the following month, pinda (ritual rice balls) is offered to or uttara kriya (last rites) is performed for deceased family members upon the banks of River Kaveri at Bhagamandala.